Eurasian Calamus plant, Acorus calamus, is also known as Sweet Flag and Sweet Sedge. One of the ancient herbs of Europe. Calamus is a water plant prized for its aromatic and bitter rhizome. 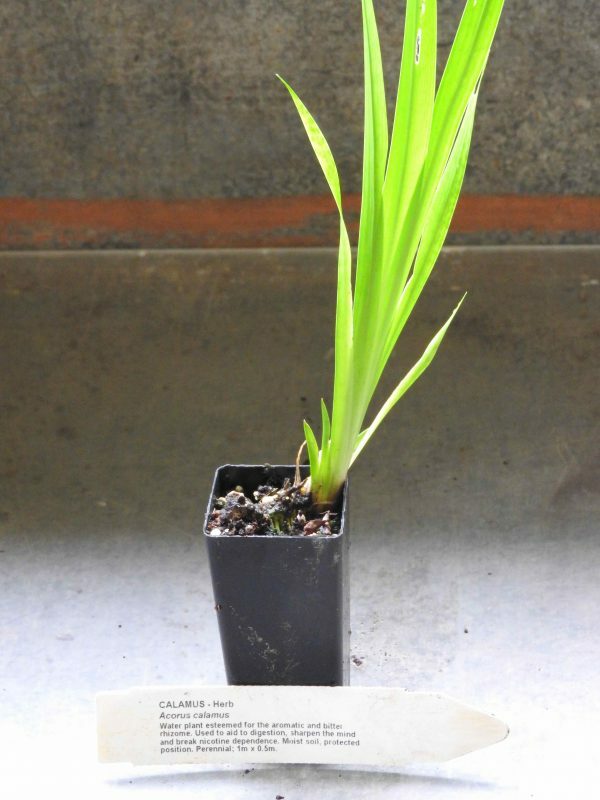 Grow in a moist spot or in a pot with saucer under to hold water. The rhizome used as a fixative in pot pouri and perfumery. An aid to digestion, to sharpen the mind and break nicotine dependance. The powdered root is utilised as a flavouring agent, a snuff and an insecticide. Roasted root eaten as a vegetable. Eurasian Calamus plant is indigenous to the Northern Hemisphere and prefers lake edges, swampy ditches or marshes in a protected position. Frost resistant but drought tender. A perennial plant, growing to 1m x 0.5m. Be the first to review “Calamus, Eurasian plant” Click here to cancel reply.